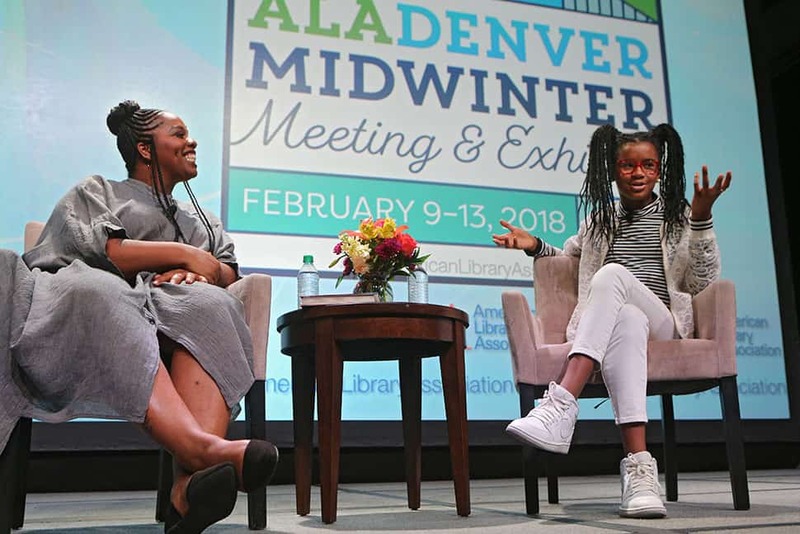 Winter storms snarled many travel schedules but ultimately could not keep attendees from the American Library Association’s (ALA) 2018 Midwinter Meeting & Exhibits in Denver February 9–13. Just over 8,000 registrants came to the Mile High City for five days of presentations, conversations, and innovations, many of which centered on the importance of making sure that people from all socioeconomic backgrounds and walks of life have a voice in our national dialogue. 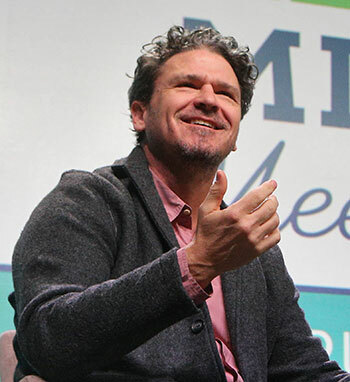 As part of the Auditorium Speaker Series, author and publisher Dave Eggers told the crowd the story of how he came to notice that the Statue of Liberty appears to be in motion, seeming to stride off her pedestal as if to meet new immigrants in the sea. That discovery inspired his latest children’s book, Her Right Foot (Chronicle Books, 2017), illustrated by Shawn Harris, which he wrote in part to address the anti-immigrant tone of the 2016 election. Welcoming immigrants, specifically refugees, was also the focus of “Project Welcome: Refugee Resettlement Agencies and Libraries,” a Symposium on the Future of Libraries program. Moderated by Clara Chu, director of the Mortenson Center for International Library Programs at the University of Illinois at Urbana-Champaign, the panel discussion featured individuals from libraries, nonprofits, and government agencies who detailed efforts to make the resettlement process as easy as possible for their refugee communities. “Libraries carve out a special place for refugees in our community,” said Joseph Wismann-Horther, integration partnership supervisor for the Colorado Refugee Services Program. He cited stats and trends about the current state of resettlement and refugees both in the US and abroad. The numbers were staggering: 65.6 million people, more than half of whom are under age 18, have been forcibly displaced from their homes worldwide. Reaching these communities and helping them feel welcome in their new homes is where libraries can take the lead by being a safe space and by offering services that aid in integration and learning, he said. 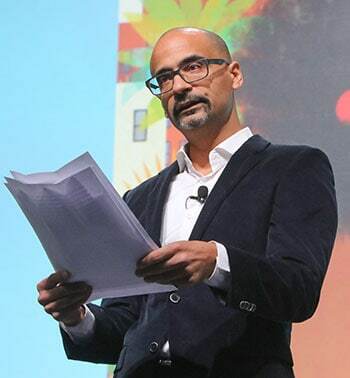 Pulitzer Prize–winning novelist Junot Díaz, who emigrated from the Dominican Republic at age 6, addressed a capacity crowd as an Auditorium Speaker, saying, “A librarian gave me the gift of libraries, and to this day, I consider it one of the greatest gifts I’ve ever received. 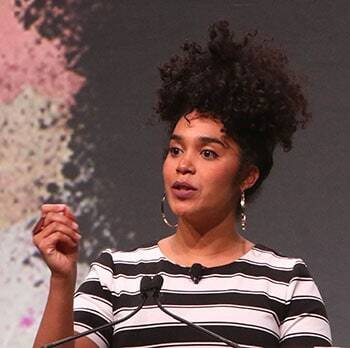 “Although I was always a reader, I think I was a writer first,” poet and author Elizabeth Acevedo told attendees at the Arthur Curley Memorial Lecture. “I grew up in a house of storytellers.” Acevedo is the author of two poetry collections and the forthcoming novel in verse, The Poet X (HarperCollins, 2018), from which she read an excerpt. For many years, public libraries have partnered with StoryCorps, a nonprofit founded in 2003 by radio producer Dave Isay to record, preserve, and share the personal stories told by Americans from all backgrounds. Maura Johnson, a community training specialist for StoryCorps, gave an overview of the organization’s recent activities and initiatives as part of the Symposium on the Future of Libraries. One new initiative is StoryCorps DIY, an online course developed with libraries in mind, that provides do-it-yourself resources to help organizations develop their own interview collection projects. The course covers planning, recruiting interviewees, interviewing, recording equipment, ethics and consent forms, archiving, editing, sharing, and promotion. StoryCorps also offers an app to make it easier for libraries and other groups to add voices from their own communities. Encouraging libraries to move from library-centric advocacy toward community-centric advocacy was the aim of the “Advocacy and Intellectual Freedom Bootcamp,” a collaboration between ALA’s Office for Intellectual Freedom and the Office for Library Advocacy. Attendees were urged to consider conducting one-on-one interviews rather than survey-based community needs assessments; asking legislators what they are hearing about the issues in their communities, rather than bringing them the library’s needs; keeping library messaging consistent to build the library brand; and being brave enough to start having conversations about tough community issues. Societal shifts happen so often and so quickly that it can be difficult for public libraries to develop library programming that will meet the needs of their patrons in the future. Two staff members from the Denver Public Library (DPL), Viviana Casillas, a program administrator, and Yanira Duarte, the Summer of Learning program coordinator, shared how their library is responding to the needs of their changing community. The session, titled “Equity-Driven Services and Programs: Exploring Alternative Information Services at the Library,” took place as part of the Symposium on the Future of Libraries. Duarte and Casillas explained the “inward-to-outward” method that DPL uses to respond to community needs. Their initiatives typically start with an inward perspective that is based on input from library staff members. Everyone is encouraged to make suggestions, from janitorial staff to upper-level administrators. DPL uses these suggestions, along with community assessments and input from community partners, to create strategic initiatives for programming and services. 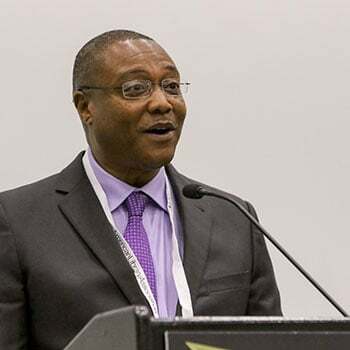 Keynote speaker Anthony Graves spoke of perseverance and hope at the 19th annual Martin Luther King Jr. Holiday Observance and Sunrise Celebration, held the morning of February 12. Graves spent more than 18 years imprisoned after being wrongfully convicted of murder. After his conviction was eventually overturned and he was released in 2010, Graves became a community advocate and public speaker, creating a foundation to push for criminal justice reform. In 2016, Graves was able to have the prosecutor of his case disbarred for presenting false testimony and for withholding information that led to his wrongful conviction. 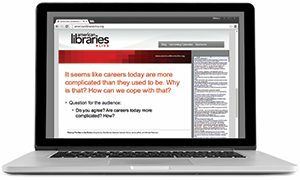 Among those arguing yes was James LaRue, director of ALA’s Office for Intellectual Freedom, who said, “Neutrality does not mean librarians have no values—we do.” He defined neutrality as not denying access to library services and resources, and not seeking to silence people on the basis of their backgrounds or beliefs. To fine or not to fine? In “Fine-Free Future,” a Symposium on the Future of Libraries program, three librarians waded into the debate to advocate for the elimination of fines for overdue materials and to advise librarians on how to make a case to administrators and community members who may be opposed to the idea. Barriers exist for some populations to pay fines, and by enforcing them, libraries are subverting their core values, the trio argued. Sustainability was the topic on the table at “Sustainability Strategies for Libraries and Communities,” another Symposium on the Future of Libraries session. The four panelists sharing experiences and best practices included Joe Mocnik, dean of libraries at North Dakota State University in Fargo. 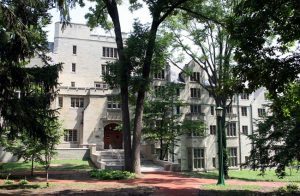 He described the successes that the library “has somewhat participated in or promoted on campus,” including energy upgrades, LED walkway lighting, recycling, water bottle filling stations, energy program grants from the state, and a bike-share program. 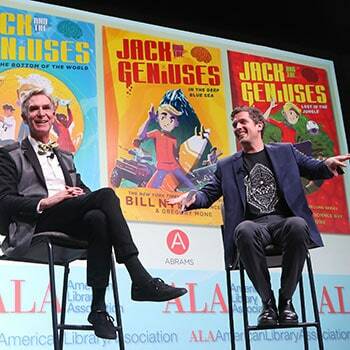 Educator, entertainer, and engineer Bill Nye and journalist Gregory Mone, authors of the bestselling Jack and the Geniuses series (Amulet Books) for middle-grade fiction readers, were the conference’s Closing Session speakers. The two friends had easy on-stage rapport and ripped through a variety of topics—from how they met to inspiration for their books to scientific hypotheticals and fact-checks—before taking questions from the audience. Though the series is greatly influenced by Nye’s love for the Tom Swift Jr. books—flying labs and all—it was important to Nye and Mone that the science was factual and their characters were rooted in the real-life accomplishments and inquiry of kids featured in the news, such as the 16-year-old who built a functional submarine, or the 8th grader who learned mechanical engineering to build a robotic arm. As always, one of the meeting’s major highlights was the announcement of the Youth Media Awards (YMA). Winning the John Newbery Medal, for the most outstanding contribution to children’s literature, was Hello, Universe by Erin Entrada Kelly. The Randolph Caldecott Medal, for the most distinguished American picture book for children, went to Wolf in the Snow, illustrated and written by Matthew Cordell, while the Coretta Scott King Book Awards, which recognize African-American authors and illustrators of outstanding books for children and young adults, were awarded to Piecing Me Together by Renée Watson and Out of Wonder: Poems Celebrating Poets, illustrated by Ekua Holmes. We Are Okay, by Nina LaCour, won the Michael L. Printz Award for excellence in literature written for young adults. The ceremony announced more than 20 awards. 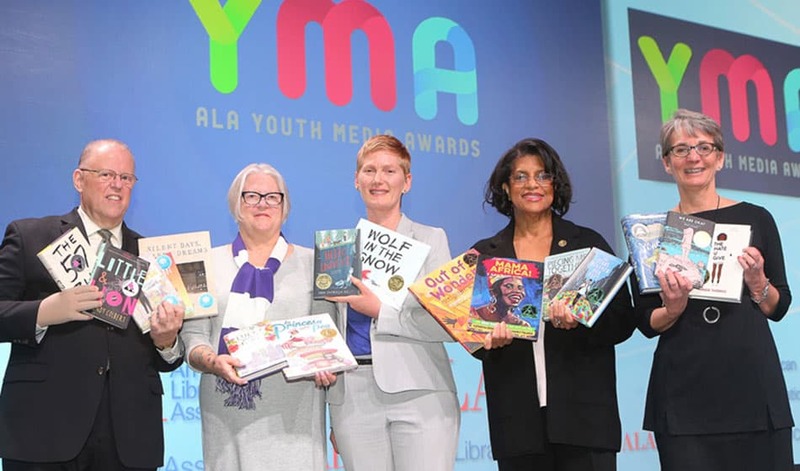 For more YMA coverage, watch a video of highlights, listen to the Dewey Decibel podcast’s special episode, or view a list of YMA winners at The Scoop. Also announced at the meeting were the winners of the 2018 Andrew Carnegie Medal for Excellence in Fiction, which went to Manhattan Beach by Jennifer Egan, and the 2018 Andrew Carnegie Medal for Excellence in Nonfiction, which was awarded to You Don’t Have to Say You Love Me: A Memoir by Sherman Alexie. Sarah LeMire, chair of the ALA Scholarships and Study Grants Committee, presented a motion (CD#31) to create the Lois Ann Gregory-Wood Fellows Program honoring Gregory-Wood’s 50 years at ALA. The motion passed unanimously. Janet T. O’Keefe, acting chair of the ALA Membership Committee, presented a resolution (CD#32) on adjusting personal member dues. The motion passed and now moves to a full membership vote on the 2018 spring ballot. ALA Immediate Past President Julie B. Todaro proposed ALA Honorary Membership (CD#34) for Librarian of Congress and former ALA President Carla D. Hayden. The motion passed. Policy Monitoring Committee (PMC) member Jennifer Boettcher presented the PMC report (CD#17) with three action items. The first motion proposed that text on politics in American libraries be incorporated into the ALA Policy Manual. The second motion proposed that text on equity, diversity, and inclusion be added to the Policy Manual. The third motion proposed to add definitions of equity, diversity, and inclusion to the Policy Manual. All three motions passed. Susan Considine, chair of the Committee on Organization, presented a report (CD#27) with two action items. 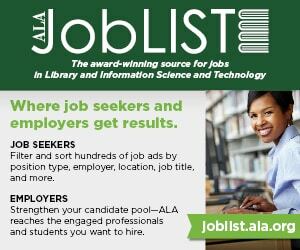 The first proposed the dissolution of Federal and Armed Forces Library Round Table and merger with Association of Specialized and Cooperative Library Agencies to form a new ALA division named the Association of Specialized, Government, and Cooperative Library Agencies, to take effect September 1, 2018. The motion passed. A second motion proposed the dissolution of the Joint Committee on Archives, Libraries, and Museums to establish as a Membership Initiative Group. That motion also passed. Vivian Bordeaux, chair of the ALA Council Tellers Committee, presented the report on the ALA Executive Board Council election results (CD#11.2). Ed Garcia, Maria McCauley, and Tamika Barnes were elected for three-year terms (2018–2021) to the ALA Executive Board; Diane R. Chen was elected to a five-month term (February–June 2018) to complete the remainder of ALA President-Elect Loida Garcia-Febo’s member-at-large term. Robert Banks, acting chair of the Committee on Legislation (COL), presented the COL report (CD#20), including information about the White House FY2019 budget, the new ala.org/fundlibraries advocacy page, and net neutrality efforts. ALA Washington Office Associate Executive Director Kathi Kromer provided an update on ALA’s advocacy response to the White House budget—more than 5,000 emails were sent to members of Congress in the first 24 hours. Helen Ruth Adams, chair, presented the Intellectual Freedom Committee report (CD#19–19.2), including updates on materials challenges and censorship, hate crimes in libraries, and its new Selection and Reconsideration Policy Toolkit for Public, School, and Academic Libraries. A motion to adopt position paper “Net Neutrality: An Intellectual Freedom Issue” passed. A second motion to adopt position paper “Visual and Performing Arts in Libraries: An Interpretations of the Library Bill of Rights” also passed. Read our full team coverage of the 2018 Midwinter Meeting & Exhibits at the Scoop. Amy Carlton, Terra Dankowski, Miranda Doran-Myers, George M. Eberhart, Phil Morehart, Sanhita SinhaRoy, and Carrie Smith contributed reporting and editing for this story.